SQUIRREL INFORMATION: The Eastern Gray Squirrel is a very common animal nationwide. They are very fast and agile creatures, and amazing climbers. They are rodents, and love to gnaw and chew. They are mostly active in the morning and evening. Diet consists primarily of grains and nuts. Squirrels usually weigh not much more than a pound, and don't usually live much more than two years. They have two litters of 3-5 babies per year, once in August and once in February. The young grow quickly, then set out on their own. They're living in the attic. Chewing their way into eaves or soffits. Electrical outages or fire risk due to chewing on wires. Chewing on woodwork in house. Squirrel fell down the chimney. We frequently deal with Tampa squirrels. We are not an extermination company or a regular pest control company, and we would never attempt to poison squirrels. 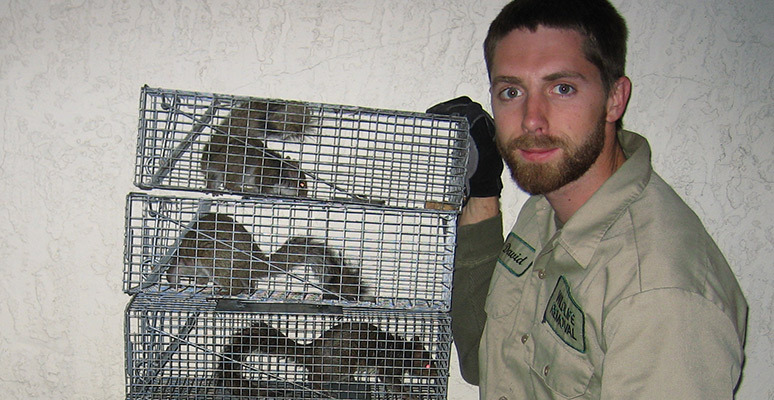 We humanely trap and remove squirrels and we provide a permanent solution via prevention techniques. Call us any time at 813-404-7033 and we'll take care of your squirrel problem! What attracts squirrels to your yard? I need immediate assistance in trapping a squirrel(s) that have made my attic their home. This problem has been ongoing for a few months. However, last week I had a trapper come by my home to get rid of the squirrel. The only thing he did was determine where the hole was and put some type of covering over it. Needless to say, I wasted my money because the squirrels are still there. I basically hear them every morning rumbling around or running across the ceiling and it is very annoying. Your prompt assistance in this matter is greatly appreciated. Thank you for your time. Hi Tampa Animal Control, I really appreciate you putting together all this squirrel info � great resource dude! So, few months back wife and I started hearing scratching in the wall near our kitchen bay window when we�d be watching tv at nite. We are thinking its squirrels and now its little more frequent (maybe babies but not sure). I say freq because over time we are noticing it upstairs in the wall near our bed (of course wife freakin out � haha). So, I used to have numerous double door Havahart traps going up and catching birds and squirrels in the yard for fun. I have found an older 7� door trap that I will attempt to use soon. Sounds like maybe better to close one of the doors and just use one side, then put peanut butter and few nuts in back. I was going to try and place trap in the drop ceiling of the basement right near the kitchen bay window, but sounds like I may need to go in attic regardless. If there are babies then I know I will or find them ! ha I�m really trying to hold off having pros do it, because we were quoted like 1300 to remove them (whether one or more). Time will tell I guess cause I may need too.